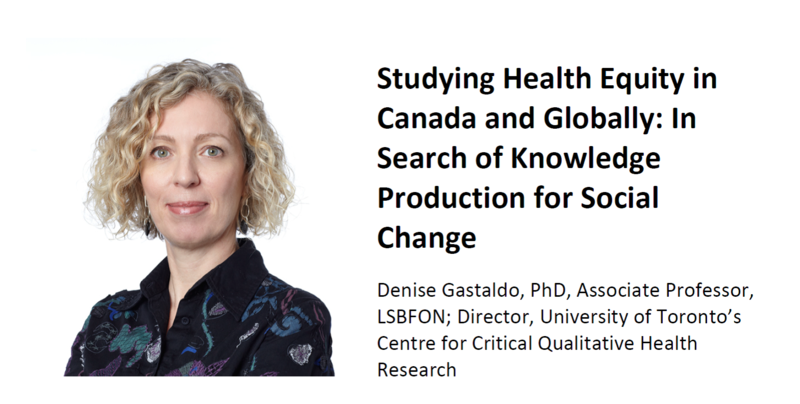 On Monday, November 12, 2018, The Lawrence Bloomberg Faculty of Nursing will be hosting a talk from Dr. Denise, Gastaldo entitled “Studying Health Equity in Canada and Globally: In Search of Knowledge Production for Social Change”. Denise Gastaldo, Associate Professor, Bloomberg Faculty of Nursing and Dalla Lana School of Public Health, is the Director of the Centre for Critical Qualitative Health Research at the University of Toronto. She is also the co-lead of GLOMHI – Global Migration and Health Initiative and co-founder of the International Nursing PhD Collaboration that involves nursing faculties in Canada, Spain, Mexico, Australia and Finland. Presently, she is the Canadian coordinator of Qualitative Health Research Network Brazil-Canada. Dr. Gastaldo has supervised over 40 graduate students in Nursing and Public Health in several countries. Join us for an insightful presentation from one of our stellar researchers. Bring your lunch – light refreshment will be served. RSVP to research.nursing@utoronto.ca by November 7, 2018. Cite this page as: CQ. (2018, October 29). Studying Health Equity in Canada and Globally: In Search of Knowledge Production for Social Change. Retrieved from: https://ccqhr.utoronto.ca/2018/10/29/studying-health-equity-in-canada-and-globally-in-search-of-knowledge-production-for-social-change/.